I know this site is supposed to be primarily about gardening but, as I may have mentioned, the weather is so rotten, there isn’t much gardening getting done. So I’m trying to find other interesting things to write about. Yesterday evening, after a typically miserable day, the sun came out and around 7pm we decided to blow some cobwebs off with a trip to the seaside. We live about 12 miles from the nearest coast, which isn’t as close as we’d like, but is better than the 60+ miles it was from our previous home. When we arrived the sun was still out and the tide was well on it’s way in and we enjoyed a very pleasant walk along the waters edge. What made this more enjoyable was the fact that we did some beach-combing. We’ve done beach-combing before, but never found anything of note, save the odd shell and a red onion! Yesterday was different, there were lots of lumps of interesting driftwood washing up all along the shore. Whether it was due to the time of day, the time of year or the bad weather, I don’t know, all I know is that it made for a pleasant and interesting evening. Where had they come from, what had they been, how had they got into the sea? The questions were endless, sadly with no answers. Most of the pieces were small and ugly or interesting but huge, nothing that we could have sensibly brought home for use in the garden. Then we spied a piece that was both small and interesting, and here it is. 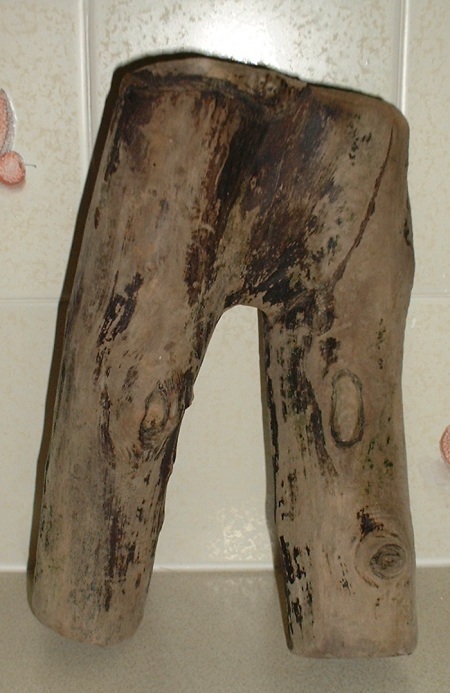 It stands around 11″ high and looks like a pair of walking legs, complete with kneecaps. How quirky is that? !